Growing up, my mom always made turkey for Thanksgiving. The stuffing was always a Chinese Sticky Rice (which I asked my mom to bring this year) and the rest of the dishes on the table were also Chinese. Basically, it was a Chinese meal with a Roasted Turkey as centerpiece. I give my mom a lot of credit for trying to provide us with the Thanksgiving experience. We certainly stuffed ourselves silly and we usually had tons of extended family over. All requisites met right? Well, one year I told my mom everyone else had cranberry sauce so from then on she started to buy canned cranberry sauce. It was that stuff that came out of the can in one solid cylinder and was then sliced into rings. While not much of it was ever really eaten, we kept up the American tradition. 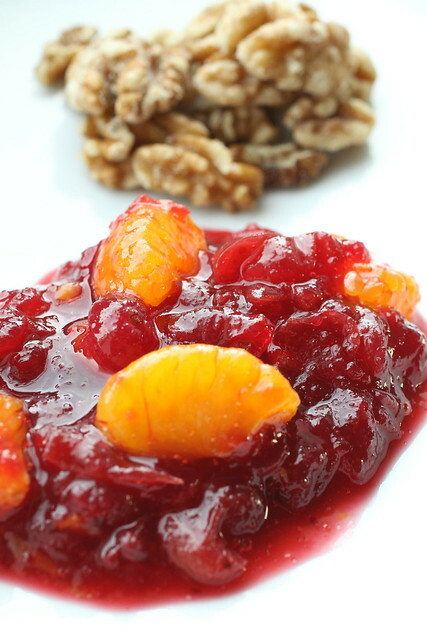 Then one year my mom got a recipe from somewhere ( at this point she doesn’t remember where she got it) that mixed canned cranberry sauce, canned mandarin oranges, and walnuts, plus a little gelatin to hold it together more. I loved it and never let my mom forget to make that cranberry sauce every year after. After my brother and I grew up and moved out, my mom stopped hosting Thanksgiving. I’ve been spending it with Lon’s family for the last several years since it’s not a Chinese thing…It’s been a long time since I’ve had to do more than just bring one dish.